In my earlier post (Restart Recovery-Database Startup Sequence), I studied the overall database startup sequence as part of the restart recovery process for databases on a SQL Server instance. The conclusion that I came to was that the restart recovery is a multi-threaded activity and multiple spids are utilized to bring the SQL Server instance online in the shortest possible time frame. The first database to come online is (obviously) the master database followed by the rest of the system databases in sequence (resource, model, tempdb, msdb and Reporting Server related DBs). Finally the user databases are brought online. The question that now came to my mind was that it is possible for an instance to have multiple user databases. What would be the startup sequence for these user databases under normal conditions? 17:41:21 spid24s Starting up database ‘AdventureWorks’. 17:41:21 spid25s Starting up database ‘AdventureWorksDW’. 17:41:21 spid26s Starting up database ‘AdventureWorksLT’. 17:41:21 spid27s Starting up database ‘AdventureWorks2008’. 17:41:21 spid28s Starting up database ‘AdventureWorksDW2008’. 17:41:23 spid24s Starting up database ‘AdventureWorksLT2008’. Multiple spids are assigned to recover the user databases in order of their database_id. SQL Server started 5 separate processes to recover 5 out of the 6 user database. The 6th database was handled by the first spid that completed it’s work based on whether the scheduler had capacity available. In conclusion, restart recovery of system databases has a specific sequence that is followed by SQL Server, but when it comes to user databases, the order is governed by the database_id of the database. This topic is by no means complete. There is a lot more to explore, so, if you have any related observations/questions, please do share them via the blog comments, or send them on my Twitter handle (@nakulv_sql). 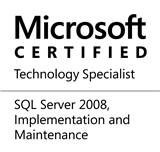 This entry was posted in #SQLServer, Blog, Imported from BeyondRelational and tagged #SQLServer on November 8, 2012 by nakulvachhrajani.